The rolling countryside of New York state that leads to Watkins Glen looks just like England. As I speed along the winding roads that traverse the green patchwork fields, the scent of beer wafts in through the window from a nearby brewery. The Glen is getting closer. Any doubts I might have had about the kind of pedigree to expect from a Grand-Am event at the home of American road racing will soon disappear. As I drive into the circuit to test five different Daytona Prototype cars, the indie rock playing on the radio dies down. Right on queue, the classic Formula 1 theme tune, The Chain by Fleetwood Mac, comes on and I’m instantly connected to the track’s heyday of F1 racing: real men at The Glen. Yet the future of sportscar racing hangs in the balance. That phrase has been worn out time and again as boom and bust has built, then broken, one sportscar racing series after another. From Group C to GTP, old-school GT1 to the FIA Sportscar Championship, one after another have come and gone, replaced by the European and American Le Mans Series of today. But there is an alternative. 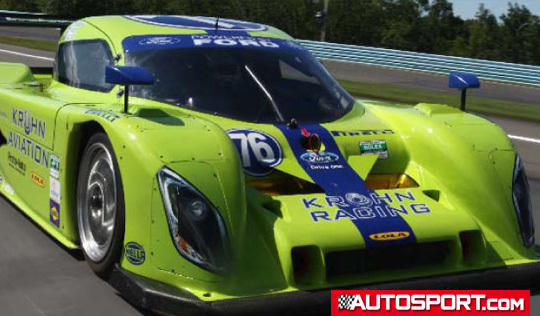 In 2000 Grand-Am was born, and three years later so was its Daytona Prototype category. Like the Le Mans Series, Grand-Am boasts two categories of racing, with both GT and prototype cars competing on the track at the same time. Unlike Le Mans, however, there are no confusing subclasses like P1, P2, GT1, GT2, GT-I-just-lost-count. The Daytona Prototypes raced in Grand-Am may not be as technically advanced as their Le Mans-prototype cousins, but that might just be the reason that this series will outlive all the others. The Le Mans 24 Hours spawned the 700bhp flying saucers that we know and love such as the Audi R15 and Peugeot 908. Unlimited budgets have meant that only manufacturers with deep wallets can actually field a winning car. flight, the likely cycle over the next few years will encourage privateer teams to return with renewed hopes of actually winning – until a manufacturer returns and splashes them with a new hyper car. Or worse, no manufacturers develop high-budget racing cars in the future and the dwindling audience will see the series sputter out. It could produce a perfect cocktail of despair. The Daytona Prototype, by contrast, is built to last. For example, the firstever Riley DP car (chassis number 1) built back in 2004 is still winning races in Grand-Am after multiple seasons and 24-hour events. It even has a resale value! “When are you planning to upgrade the design of these cars?” I ask Dave Spitzer, Grand-Am’s vice-president of competition. “We’re not,” he answers. In the Grand-Am hauler I’m given the lowdown on where the series is going. It sings like a mantra: “Longevity, stability, sustainability, competition, entertainment.” Everyone in the pitlane can count on the fact that this series will still exist in the long term, because the system is in place that prevents teams and manufacturers from overspending and generally screwing things up. There’s a free market to buy your steel tubeframe chassis from five different manufacturers. Take your pick from Coyote, Riley, Crawford, Lola or Dallara. Brakes and damper suppliers are limited to a few, and the parts they can supply to teams are coded and restricted to save costs. Engines are open game too, and they come right off the counter as road specification motors. Choose from Ford, Lexus, BMW, Porsche (in both official flat-six and unofficial V8 format), Chevrolet and Pontiac. Immediately, that is an incentive for car manufacturers to buy into a series that uses street-relevant product. The internals are weighed and measured so that if a tuner decides to get cute by developing super-light camshafts, the organisers can seize the ECU, or the engine, or the whole damn car, and test it. They have their own dyno in Concorde to determine if the enhancement falls outside the rules. In any event, all the cars are taken for testing at NASCAR’s windtunnel, the entire shape of each car is digitised and every component is numbered. Testing is limited, which is why the teams are stripped of their stock Pirelli tyres after every event. A constructor can request a tunnel test, or a team can request mileage to bring a gentleman driver up to speed. If teams abuse the system by dropping in a pro to progress development, the long arm of Grand- Am will feel their collar. “Monitoring that tends to be self-policing with these guys, but we’ve got access to ECUs that tell us a lot more than teams realise,” adds Raffauf. After the qualifying session, I find Spitzer in the race officials’ hauler, glaring down at several sheets of numbers. “Well, would you just look at that,” he muses. These are speed-trap recordings from the main straights tech spec detailing the top speeds of every car in the field. Spitzer is captivated by a shred of data that suggests ‘overperformance’ from one of the cars. In the case of Audi or Peugeot versus the rest of the field in Le Mans racing, the parity of performance is so wide that for the big teams it’s like swatting a fly with a Hummer. In Grand-Am, the organisers run things a little differently. Car companies are more than welcome to come in and outspend the opposition with their trackside marketing campaigns, but they can’t buy success on the racetrack. And boy, do they race. In this year’s 24-hour race at Daytona, the gap between first and second after 735 laps of nailbiting racing was just was 0.167s, with the first four finishers covered by 10 seconds. Over a season the cars will pound Tarmac to the tune of 5700 miles of racing over their 12-race season. To get a first-hand view of the cars’ performance, I’m going to lap five different DPs around the short track at Watkins Glen. If I drive them like a Le Mans prototype, I’m going to be killed on my out-lap! First up is the Coyote Porsche (the V8 variant developed by the Lozano brothers’ Spirit of Daytona team), as driven by Antonio Garcia and Buddy Rice. After I warm the tyres a little on my out-lap, I give the car a nudge through the super-fast esses. They call it ‘the tunnel’ because the Armco narrows and closes right up to the edge of the track just as the cars slither across the brow of the corner at about 140mph. Had I not left my passport with the team manager, I might have planted my foot on the gas a lot harder… and fired it straight into the retaining wall. Daytona Protoypes have a lot less downforce than an LMP1. As the car enters the esses, the front end feels a little vague because the tyre temperatures are low. Only as the mechanical grip of the car begins to work can I commit to a higher entry speed. Under braking the car is solid, the pedal is firm and I can really stand on it to haul the car up for the chicane on the straight. In the mid-corner the front feels a little light again, a symptom of the low-downforce set-up the teams run here. Next, the Doran Racing Dallara-Ford. The car feels similar in terms of downforce to the Coyote, and it transpires that these are the only cars I’m testing that are running standard ‘Glen’ low-downforce set-ups (the others have wisely slapped a load of wing on to keep the rookie off the grass!). The Dallara feels a little stiffer, and on the back straight towards the pits I notice the car bouncing on the bump rubbers as I brake for the 90-degree left at Turn 10. Into the Riley-Ford of Michael Shank Racing, and the first thing I notice is the slightly crooked steering wheel. The car is in a high-downforce setting in the form of a larger rear gurney flap and front dive planes. That makes it feel instantly faster and more stable than the other two. The brake pedal has more play in it, but overall the car feels great. It’s easier to feel the transition from mid-corner understeer to exit oversteer with the Riley, because the car feels stiff and responsive. That switch happens quickly in these cars, perhaps due to the short wheelbase, as they wriggle away from the apex of the corners. I feel really at home with the Crawford-Pontiac, run by the in-house works team, largely because of the brake pedal. It’s solid, but has an excellent feel so I can control the speed of the car all the way to the turn-in point. That control is definitely worth time on the stopwatch. This team also sends me out on a high-downforce setting. I’m driving hard into the long, fast, cambered right-hander at Turn 5 and can feel the car taking support from the bump rubbers in the midcorner. The car is awesome there. Although the cars with high downforce feel better, there is no way they could race like this. Thanks to the steel brakes and the evenly-matched engines, teams are forced to run lean aero settings in order to survive the drag races into the braking zones. By the time I drive the Lola-Ford of Krohn Racing, I know my left from right and am ready to push a little. The cockpit bears a lot of resemblance to a Lola Formula 3000 car, with the familiar wooden gearknob and the well-proportioned steering wheel. I don’t need to drive this car to have a reason to buy it: it’s fitted with an air-conditioning unit that blows cool air up my back from my bum to my neck. Genius! As I hurl the car into the first few corners, I nearly spin. The car leans over and darts into the corner so fast that it feels like I’m on a Waltzer ride at a fairground. Talk about turn-in oversteer! The brake is hard, but lacks feel. The only comparisons I can offer across all the different cars are quite meaningless. I liked the seat in one, the steering wheel in another, the brake pedal of this one, the aero or mechanical balance of that one. Variations like high to low downforce and driver-led mechanical set-ups far outweigh the characteristics peculiar to one chassis or another. Zonta didn’t like the feel of his Lola on Friday so he changed it. He won the race on Sunday. Compare the front end of the Lola or the Riley, and the difference in the aero package is huge. The Lola has hardly any visible front aero, no louvres or dive planes, while the Riley is covered in them. Yet the end result is within a few tenths of a second. That is a testament to how hard the series organisers are working to protect the competition between the manufacturers. The biggest single difference you notice from one car to the next is the people bolting them together, engineering and driving them. The paddock is littered with familiar faces from Formula 1, Indycars, sportscars and NASCAR. What a mix! Rubens Barrichello is rumoured to be hunting for a seat alongside the intake of star drivers – Tony Stewart, Jimmie Johnson, Juan Pablo Montoya, Scott Dixon and Dario Franchitti are regulars in the Daytona 24 Hours. Watching drivers from the world’s biggest racing series slog it out in nigh-on-equal machinery is pure entertainment. Thanks to the ‘Daytona Challenge presented by Sunoco’, a winning driver from British Formula 3, GT, Radicals or SPEED will also be thrown into a hot seat for the Rolex 24 Hours. Daytona, by the way, is next to the beach and the dollar exchange rate is cheaper than the euro. Yes, you can drive to the French race in June, but if you prefer sunshine and beer to garlic and puddles, then consider a cheap flight to Orlando next January.